So my day started with a ride from our place to the start, the Golden Gate Bridge, some 5 miles away. As usual got my brevet card and by 6:00 AM Todd, our Regional Brevet Administrator, let us go. This time the limit of 75 rides was reached but after the normal sidewalk traffic on the bridge, from to Sausalito to Mill Valley I didn't see many riders. Last year I got lost and then had a hard time when I tried to catch up with a group I was riding with before stopping (and then getting lost) So this time around I decided I would not make the same mistake. On the other side of the Fairfax hill a tandem and a couple of rides passed me, they where going at a good pace so I jumped in that train and took turns at the front. We rode together to the secret control, a patch of dirt where Todd had parked and was stamping our cards. There was a rider on a Single speed, maybe a fixed that needed a 15 mm cone wrench to fix a flat, I carry a Leatherman pliers that could work. While I took the time to help him the other riders had left the control. The pliers did not worked, I wished him luck and kept on going. Latter on the day I remembered my extra multi tool that I carry on a different place has a 15mm pedal wrench that most likely would have worked, I felt so stupid for not being able to help the fellow rider. 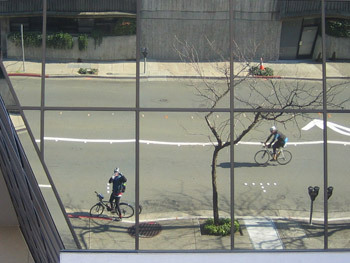 It was a lonely but sunny ride to the Petaluma Safeway, once there I bought some Gatorade and went out to fill my backpack's bladder with it. 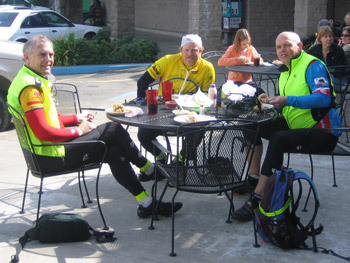 Rob Hawks, a rider that had completed the last stretch of the very wet 2006 San Francisco 200K with me was out there, I said hi he was riding with two others, Dan Brekke and Bruce Berg, and left a little before I did. I was able to catch up with them and rode the pace line without looking at my cue sheet. Apparently we all did the same, oops we missed a turn, my computer said it was four miles back. 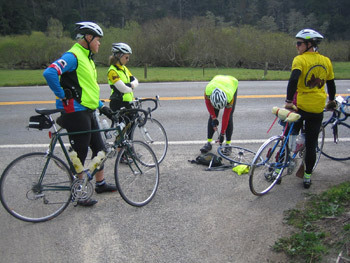 Ok back on the route but not for long, Rob got a flat, we all stopped a nice 5 minute break, on to Santa Rosa. There is this building downtown where last year I wish I had a camera, well this year I had 2 cameras my daughter's little Canon SD200 and the $12 Aiptek Pen Cam. Out came the Canon and I got the shot. Unfortunately the others were a block ahead so it was only another rider (did not get his name) that rode with us to Healdsburg and I on this photo, may be next year will get more faces on the picture. Miles went by fast all the way to Healdsburg the next control. Got some Tomato juice that we split with Dan and also some water. Bruce suggested lunch at the taqueria some doors down from Safeway, we sat outside, the service was fast and the sun was out, nice. We took about 45 minutes to an hour there when we left my legs where complaining and I had a hard time getting up to speed again, fortunately this stretch of road between Healdsburg and Hwy 116 is very scenic and sees little traffic so the riding was very pleasant. Once on hwy 116 Bruce and Dan were doing most of the work, Rob and I would take short turns up front but they really where working the most. Near the intersection of Hwy 116 and Hwy 1 Bruce got a flat, a nice opportunity to rest for my tired legs. Veronica a rider friend of them stopped while we where there but once we left she just rode slower. I was again having a hard time getting up to speed. Finally Hwy 1, I enjoy climbing more than riding flat terrain I would get a little ahead on the hills and the group would catch me on the flats, eventually they dropped Rob and I. 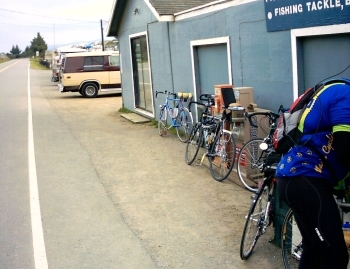 We rode together to the the Bodega Bay control, Diekmann's Bay Store in town where I had some nasty pizza and more Gatorade. When it was time to leave my legs where tired, we all left almost at the same time but Bruce, Dan and Rob soon pulled away. Somewhere near Valley Ford Bruce and Dan where on the side of the road but by the time I got to them they where riding again. 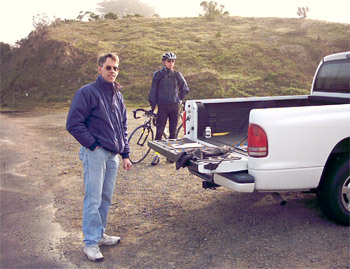 I rode within eye distance of them to the hill before Tomales where Dan dropped his chain. On the hill, again I was able to get ahead of them but not for long, as soon as we hit flat land they flew by. By now I felt the need for a pit stop and out on nowhere a Port-a-patty! great. By the time I got to Marshall Bruce, Dan and Rob where either having clam chowder or on line at the register. I don't like the soup so just got some water, put on glove liners and shoe booties on and got ready to move on. By 5:30 PM when I was ready to leave they came out of the store, Told them "goodbye for now" and left, my legs where fine I guess after taking it easy for so many miles. I was sure they would be passing me again so I kept looking back but no sign of them or any other rider for that matter. It was now close to 6 PM and was time for the lights. Riding at night is very nice and this part of Hwy 1 is very nice, the rolling road goes up and down maintaining things interesting. When I got to the intersection of Petaluma Rd and Hwy 1 started thinking something bad had happened to them, it was very unusual they had not at least catch up by now. Got the bad ideas out of my head and concentrated on the road. All the way to the beginning of the Nicasio hill I kept looking back but never saw any bicycle light. Once back on Sir Francis Drake, on the other side of the Nicasio hill, I always feel the finish is near. For me the miles always fly from Fairfax to San Francisco, I rarely stop here except for water, I want to get home! Right before the Camino Alto hill I stopped for water but the drinking fountain didn't have enough pressure to get water into the water bottle, the next drinking fountain that I know of is in Mill Valley right on the bicycle trail. I think I have enough liquid to get there. A look at the clock and I realize I may be able to beat the hour (:59 minutes) if I push it up a little. Up I go slowly but steady and very fast down Camino Alto, the new light that I had on the helmet, a Princeton EOS 1 watt LED, sure helps. At the Mill Valley drinking fountain I added some water on top of the tomato juice I had and I am good to go. I'm getting closer and closer and it looks it is going to be close but I may be able to beat the clock. This also serves me as an incentive at the end of the day when my legs are tired. When I hit Sausalito's water front I have 20 minutes before the hour. I try to go fast but don't think I'm moving much. Finally I am at the bridge automatic door, after sunset the sidewalk is closed to all except cyclist who need to press a button to gain access to the sidewalk. Fortunately tonight there is not to much wind, I'm able to push 21 m/hr, not a soul in the front or behind. When I press the "Open Sesame" button for the gate at the other end it is 8:55, I made it! 14 hours and 55 minutes odd enough, exactly my same time as last year for the same brevet. Signed up my card called my wife to pick me up and waited for her to show up. After a while Bruce and Dan came in and a little latter Rob arrived. We talked a little and I said good bye once more but not before thanking them for the ride. 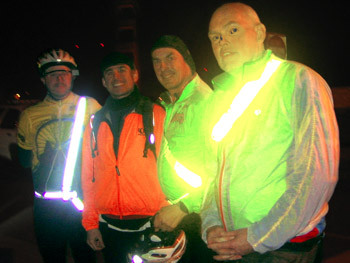 I had a great brevet thanks in part to those guys, thanks!